On what planet do the numpties at KPMG think IBRC’s loans are worth 60c in the euro? KPMG is not answering questions about its responsibilities to the National Lottery after a ball was drawn last weekend which showed both 6 and 9s on the same ball. The boo-boo has a potential maximum cost of €54,000 says An Post Lotto, though it’s not clear if checking the balls is part of KPMG’s job. Mind you, a €54,000 loss is as nothing compared to the bailout of AIB, Permanent TSB and Irish Nationwide which collectively have cost us €30bn to date. And who were the auditors? Of course, it’s not the role of auditors to predict losses but there seems to have been widespread problems with loan security and documentation which would be expected to fall within the remit of auditors generally. Minister Noonan has refused to release accounts for IBRC for the second half of 2012, so we don’t really know the book value after impairment at 31st December 2012. Here is IBRC’s grading of the loans at 30th June 2012 (there is a discrepancy with the figures above which exclude loans held for sale). Now, we don’t have an individual breakdown of the loans, but we do have a history of loan sales in Irish banks. 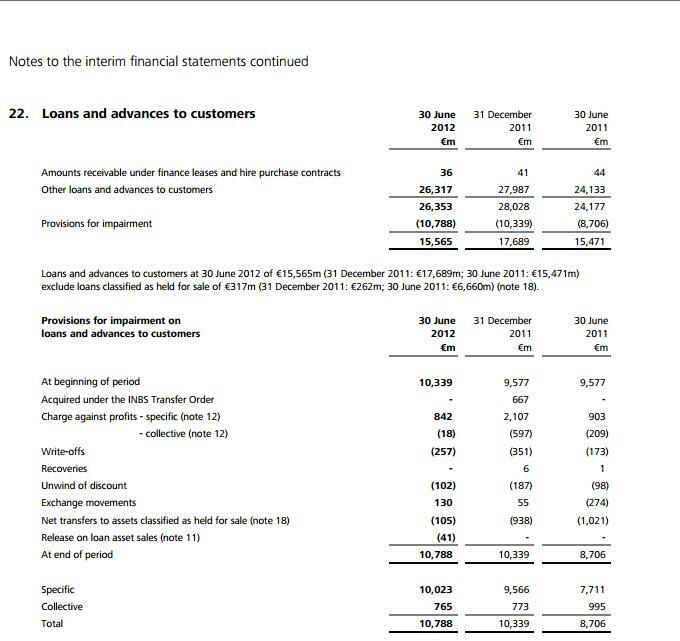 And you can see that some loans have sold for 90c in the euro and there was a recent sale of €400m of AIB loans for 80c in the euro, but these are loans which are performing with solid underlying properties and tenants. NAMA acquired its loans by reference to November 2009 property values and paid a 10% premium for so-called “Long term economic value” and NAMA paid just 43c in the euro back then. Two thirds of IBRC’s loans were non-performing at H1,2012 and Irish residential and commercial property has continued to decline since then – IBRC’s loans are mostly investment property related. As for KPMG saying the loans are still worth 60c in the euro. Hopefully this is a marketing ploy to deter low-ball bids, because the likely loss is many times the €54,000 lost last weekend with gammy balls. CoStar News has an informative piece this afternoon setting out in detail the current status of the valuations, and the expected sales process. The BBC is reporting that inoffensive crooner, Daniel O’Donnell’s childhood home, where his mum and sister and family still live, has come on the market. 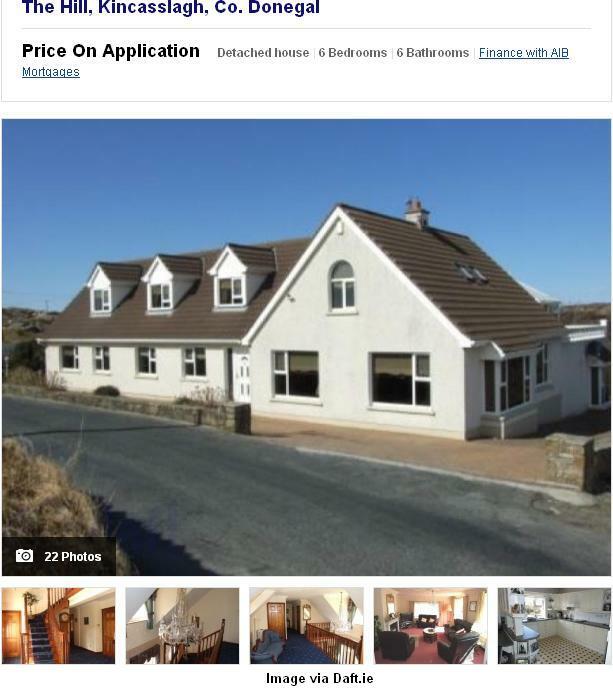 The 6-bedroom 6-bathroom bungalow on an acre in Kinclassagh in west Donegal has gone on the market this week with an asking price of €400,000. Daniel no longer lives there but the BBC says the property is a bit of a Mecca for Daniel’s army of fans with groups turning up to see where it all began in the 1980s. They’re selling up because the property is now too big for them, apparently. Daft.ie is advertising the property, and the only contact given is an individual Gavin Boyle. I say “further salary cuts” because NAMA management has already come down hard on bonuses which staff may have had good reason would arise when they joined the Agency. Alas, because the Irish property market has continued to tank, both residential and commercial, NAMA has run up big losses and at the end of 2011, had cumulative losses of €1bn. Along with the malaise with the economy generally, NAMA withdrew bonuses from a group that justifiably sees itself distinct from the civil service generally. Following a previous letter circulated by the NTMA CEO John Corrigan to all NTMA staff at the start of March 2013, NAMA staff have revolted or at least written a stiffly-worded letter. The NTMA CEO said in March that NTMA and NAMA staff would be subject to the new Croke Park 2 agreement which means that those on salaries over €65,000 would face a range of cuts starting at 5.5% for the first €80,000 rising to a 10% cut on the excess over €185,000. We know the average NAMA salary is around €100,000 and such salaries would be cut by €6,000 gross under Croke Park 2. We don’t know how the NAMA board reacted to the letter, but NAMA hardly needs industrial unrest. We don’t have a copy of the letter, so here’s an educated imagining. John Corrigan has informed us that we will be subject to the provisions of Croke Park 2 which will mean cuts to salaries over €65,000 starting at 5.5% and rising to 10%. When we joined in 2010 and 2011, we had expectations of performance related pay and bonuses if we worked hard and did our job well. Instead, NTMA bonuses in 2010 were €1,981,760 for 258 staff falling in 2011 to just €62,610 for 5 staff and €43,100 for 6 staff in 2012. We recognize that NAMA has run up losses but that’s mostly your fault for failing to change the valuation date in 2010 when it was apparent that property prices were still tumbling. We all risk ending up being profiled and reported in the press. The Paddy McKillen and Treasury Holdings court cases both saw our affidavits published and staff being named in the papers, sometimes in an unjustifiably critical light. With the country awash with foreign investors seeking local partners, and with asset managers very active in a distressed market where NAMA is but one seller, there is high demand for our knowledge, skills and experience. You have been a role model with leading from the front and supporting staff, but like you, we face short term careers at NAMA which might end in 2020 if we’re lucky, but could well find ourselves out of a job beforehand if the rump of our assets is disposed of early. The staff turnover at the NTMA is now beginning to look worrying with 9 staff or 2% of the 500 leaving in January 2013 alone. We weren’t subjected to cuts and revised public sector conditions in the Croke Park 1 agreement and we have private contracts of employment which set out our agreement salary, so we reserve the right to take legal action if you move to cut our pay. We’re working hard in a job that is thankless outside these premises, we have skills that are in demand in the private sector which pay premium salaries and bonuses and we are not legally obliged to accept further cuts. We respectfully ask that you liaise with the Minister for Finance to secure an exemption for NAMA. 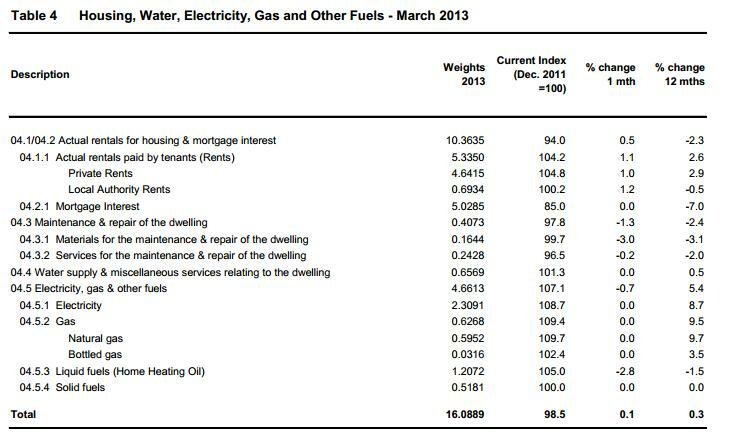 This morning, Ireland’s Central Statistics Office (CSO) has released its inflation figures for March 2013. The monthly headline Consumer Price Index (CPI) increased by 0.4% compared to February 2013, and is still only up a modest 0.5% year-on-year. March’s results mirror those of December, November, October and September, and continue a subdued annual inflation trend seen in recent months compared with the 2%+ that pertained before January 2011. Housing has stopped being the biggest driver of annual inflation, mostly because mortgage costs have been declining – by 7.0% in the past year, as ECB rate cuts and greater scrutiny of variable mortgage interest rates take effect. Just a few months ago, mortgage interest was rising by 20% per annum, and as mortgage interest costs account for over 5% of the basket which measures inflation, the impact on inflation was substantial. Energy costs in homes on the other hand, which account for over 5% of the total basket examined by the CSO, have risen by 5.4% in the past 12 months, mostly driven by the 9% price hikes at the ESB, and in October 2012 at Bord Gais. Elsewhere, private rents rose by a stonking 1.0% in the month of March 2013 – this after modest increases in February and January but bigger increases in previous months: 0.7% in December, 0.6% in November, 0.7% in October and 0.9% in September 2012. Over the past year, such rents are up by 2.9% according to the CSO – there is some small rounding in the figures above which show 3.4%. It seems that in our financial crisis, the big correction in rent took place in 2009 with a 19% maximum decline, compared to a decline of just 1.4% for all of 2010. Since the start of 2011 there has been a 8.3% increase (mostly recorded in February and October 2011 and February and September/October/November 2012 and March 2013). Rent assistance levels have not been affected by the recent Budget 2013, neither the rates nor contribution have changed. One sector that has largely managed to escape being the object in finger-pointing after the collapse of the property and banking sectors, has been Irish stock-broking firms. Davy was involved in the disastrous Irish Glass Bottle site in Ringsend where investors saw colossal losses. NCB saw 26 of its investment companies placed in liquidation in January 2013. Goodbody was very active in introducing property investments to its clients, and we have previously seen NAMA had receivers appointed to Goodbody investments. The BBC today reports on accounts recently filed for two companies 99% owned by Goodbody reveals another disastrous episode overseen by the stock-broker. GSB Northern Ireland PLC (incorporated in the Republic of Ireland) accounts for the year ended March 2012 and GSB Millmount Homes PLC accounts for year ended December 2011 are now available. GSB Millmount’s accounts reveal that GBP 32,631.08 was received as a “final dividend” from its GBP 29.7m investment in a venture called JVCO, which was a joint venture with Northern Ireland’s Taggart Homes, a company in severe financial distress. That’s just .1p in the pound. In these two companies alone, it looks like Goodbody has realized losses of GBP 55m (€65m). Maybe time for the stock-broking sector to acknowledge its role and performance in the boom and crash.